1917, Cast, blackened Iron, 58.0mm, 64.0gr. 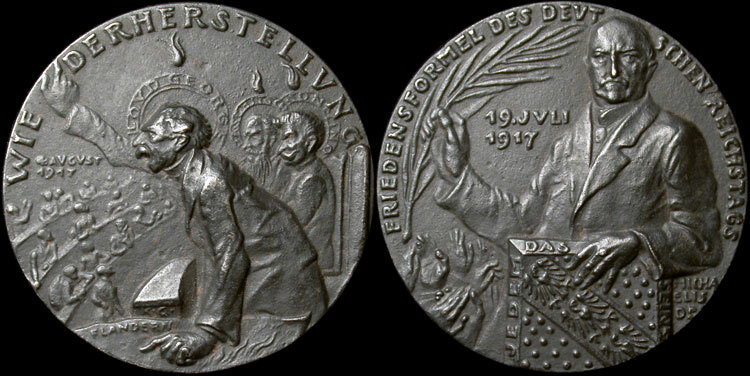 Obverse: Scene in British Parliament where Lloyd George, assisted by Nicholas Pashitch, Prime Minister of Serbia and Baron Sonnino, Foreign Minister of Italy refuse to accept German resolutions. Inscription "Restorations, August 4, 1917." Reverse: "Peace formula of the German Reichstag" July 19, 1917. On coat of arms "Each to his own."